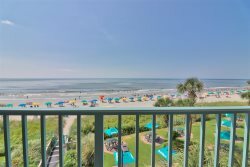 Ideally situated in the heart of the Grand Strand on magnificent Myrtle Beach, Anderson Ocean Club offers a spectacular vacation setting. This upscale resort features elegantly appointed ocean view and oceanfront suites, each with a furnished patio and extensive comforts of home. Championship golf courses and a variety of dining, shopping and entertainment venues are within easy access of the resort's central location.